Firefoxes Glass: Yes we are still alive! Come see us all! Yes we are still alive! Come see us all! This blog is so sadly neglected, I wonder if they have a protective service program for neglected blogs? Enough nonsense. We would all rather be making beads and jewelry than playing on the computer! 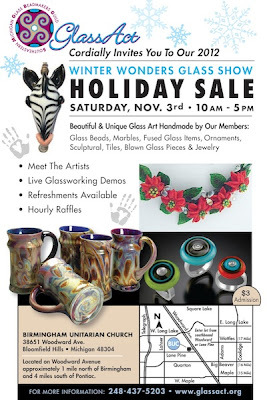 Next Saturday, November 3, all 3 foxes will be at the Winter Wonders Holiday Glass Sale, at the Birmingham Unitarian Church in Bloomfiled hills. We will be under our individual personas, Fire Dance, Works of Joy and Ugly Duckling. Admission is $3 but parking is free and so are the refreshments - which are usually pretty good. And, the entertainment is free too! Be sure to stop and say "hi" to us - look forward to seeing you!